When Rashard Lewis trotted onto the court Sunday for the first-ever game in BIG3 history, he could feel the magic of the moment. 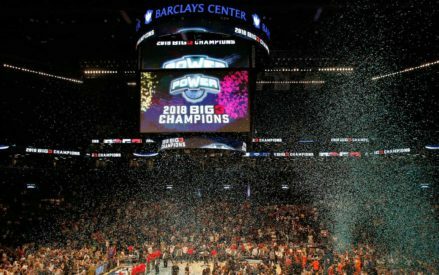 What he saw was a crowd of more than 15,000 in attendance at the Barclays Center in Brooklyn to witness the debut of the much-anticipated professional 3-on-3 basketball league. It was a day of firsts for all involved, and many of the players echoed that feeling of excitement about being back on the hardwood in front of an enthusiastic crowd. In addition to league co-founders Ice Cube and Jeff Kwatinetz, other notables who were on hand for the event included LL Cool J, Whoopi Goldberg, James Harden, Paul Pierce, Jalen Rose and DeAngelo Russell. As it turned out, with one day under its belt, Lewis leads the league in firsts. Lewis’ 3-Headed Monsters played the Ghost Ballers in the first-ever BIG3 contest. In that game, Lewis hit the jumper that gave the 3-Headed Monsters a 30-29 lead – signaling halftime. In the second half, he made the league’s first 4-pointer. And then he made the first-ever game-winning shot. After the Ghost Ballers’ Ivan Johnson scored the first points in BIG3 history – a layup with an assist from Mike Bibby – the game was close throughout. Lewis’ game-winning shot was actually a free throw that completed a three-point play. In BIG3, the first team to get to 60 wins – but you have to win by two. Ricky Davis, who led the Ghost Ballers with 23 points, helped his squad come back from a 59-54 deficit and sank a two-point free throw to give the Ghost Ballers a 60-59 lead. However, Davis missed what could have been a game-winning three-point shot and Kwame Brown got the last of his game-high 13 rebounds. Right after that, Lewis made a layup to give the 3-Headed Monsters a 61-60 lead, and a foul by Davis gave Lewis the chance to close out the game with a free throw. Lewis led all scorers with 27. Brown, with 17 points to go with his 13 rebounds, is credited with the BIG3’s first-ever double-double. Davis was one of three Ghost Ballers in double figures, joined by Bibby (12) and Mo Evans (10). Power looked to be in trouble early when captain Corey Maggette was lost for the game, but his teammates picked him up in a hard-fought win. 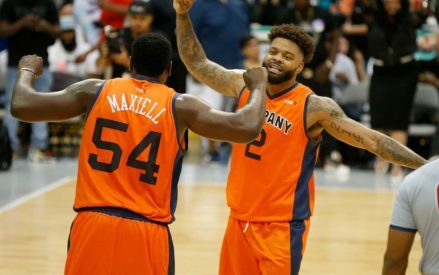 Tri-State had strong performances from captain Jermaine O’Neal, Lee Nailon and Mike James – who came the closest of anyone in Week 1 to a triple-double (13 points, 12 boards, 6 assists). Still, Power went into halftime with the lead. The highlight of the second-half was a thunder-dunk from Jerome “Junkyard Dog” Williams, off a behind-the-back pass from Cuttino Mobley. Power was leading 59-58 when DeShawn Stevenson hit a 3-pointer to ice it for Power. The crowd was at its loudest all day when The Answer took the court. Allen Iverson is the player/coach for 3’s Company and fans were psyched to see Iverson in action. That said, he was more coach than player – scoring 2 points in his nine minutes of action. Iverson was locked up with Ball Hogs captain Brian Scalabrine, but White Mamba also finished with just 2 points. Andre Owens picked up 3’s Company with a double-double, 29 points and 15 rebounds. The Ball Hogs actually led at halftime, as Rasual Butler hit a 3-pointer to give them a 32-29 edge. Butler had a team-best 22 points and Derrick Byars had 19, but it wasn’t enough to hold off 3’s Company in the second half. 3’s Company opened the second half on a 9-2 run. The Ball Hogs came back and tied it at 48, but 3’s Company then went on one last run, 13-3, with DerMarr Johnson making a 2-point free throw to close out the scoring. Johnson had 14 points for 3’s Company and Al Thornton had 13. The final game of the day turned out to be the most lopsided. Killer 3s player/coach Charles Oakley did not suit up, and perhaps they could have used the big man out there. Reggie Evans had a solid game for Oak’s squad, with 18 points and 12 rebounds. But it wasn’t enough. A Rashad McCants jumper gave Trilogy a 31-22 halftime lead, and they never looked back. Al Harrington scored six of his game-best 25 early in the second half and then hit the game-winning jumper. James White added 16 for Trilogy and McCants – the first overall pick in the inaugural BIG3 draft, finished with 15.